It's that time of year again - yes, Non-League Day (NLD) is back! This will be the ninth time the event has been held and I'm still pinching myself that a brainwave of mine could have made such an impact. For those of you that don't know, NLD is an annual celebration of semi-professional and amateur football held to coincide with an autumn international break when there are no Premier League or Championship games so as to maximise the amount of publicity we can get and appeal to as many people as possible. Originally it was intended to be an attempt to reach out to fans of the big clubs to get them to come and try out a non-league game for the first time but it's transformed into more of a general celebration of all things at this level and also a chance for clubs to raise funds, not only for themselves, but also a number of charities. This year's Non-League Day take place on Saturday - get involved! Our official charity continues to be Prostate Cancer UK and it seems almost double the number of clubs (around 100) compared to last year have signed up to support them. With Vanarama already announcing that they're hoping to raise £150,000 by NLD, the amount generated this year could be considerable! Unsurprisingly this week's guide is dedicated almost exclusively to NLD so the Daily Digest will make way for a focused look at Saturday itself. All the week's other games will appear on the match maps as usual so have a good look through them to see what else is on but remember - it is an international break so the only game taking place in the top four divisions is AFC Wimbledon's match against Portsmouth in League One on Saturday. The highlights of the midweek action which are well worth a mention are the friendly between England Women and Australia at Craven Cottage on Tuesday and England C v Estonia U23 at Leyton Orient's ground on Wednesday (England C are the country's non-league representative XI) - tickets are £10 and £5 respectively. On Thursday, Dulwich Hamlet have lined up a friendly against Crystal Palace who are sending pretty much a first-team squad minus those on international duty. Tickets are £10 and you are being urged to buy in advance as it could sell out. Lastly on Friday, two clubs who are without a game on Non-League Day have arranged a friendly. The match between Walthamstow and Clapton CFC, who both play on the Wadham Lodge site, should draw a lively crowd of several hundred and entry is by donation (suggested amount £3). There are also some FA Cup replays which have a significant amount of prize money riding on them. The draw for the Fourth Qualifying Round take place at Wembley on Monday lunchtime and I think I'm going to be there. I know I'm definitely going to the national stadium on Monday morning to record something relevant to the draw and NLD for Talksport2 so whether it will be live or pre-recorded I don't know. I'm just hoping someone gets stuck in traffic and I have to step in to help draw the balls!!! I think that's about it from me. The week ahead is likely to be incredibly hectic and I hope it's all worth it. Thanks again for all your support and if you are free, please try and get to a non-league game on Saturday no matter where you are in the country. If you're outside London, I've spent a large chunk of my time building a match finder which will allow you to discover what your nearest game is depending on your location. There's also a similar event being held in Germany - it's called Tag der Amateure and is taking place on Sunday so please give that your backing too if you're over there. Remember, semi-professional and amateur football make up the bedrock of the game is this country and around the world - do your bit to make sure those foundations stay firm. There are over 100 matches in and around the London area over the next seven days with the National League, Bostik League, Evo-Stik League, FA Trophy and FA Vase taking centre stage. Bromley v Barrow @3pm - after inconsistent starts to the season, both sides enjoyed victories on Saturday and will be looking to close the gap on the top seven by winning this game. If you buy tickets online in advance they'll only be £10 - it'll be £18 if you pay on the day. The other notable story ahead of this game is Barrow manager Ian Evatt (formerly of QPR) and his squad have part funded the cost of a supporters' coach to bring fans all the way down from Cumbria - great effort! Wealdstone v Hampton & Richmond Borough @3pm - one of the matches of the day in the London area will be this one at Grosvenor Vale. To all intents and purposes this is a derby and features two sides who are also ensconced in what will probably be a thrilling title race. 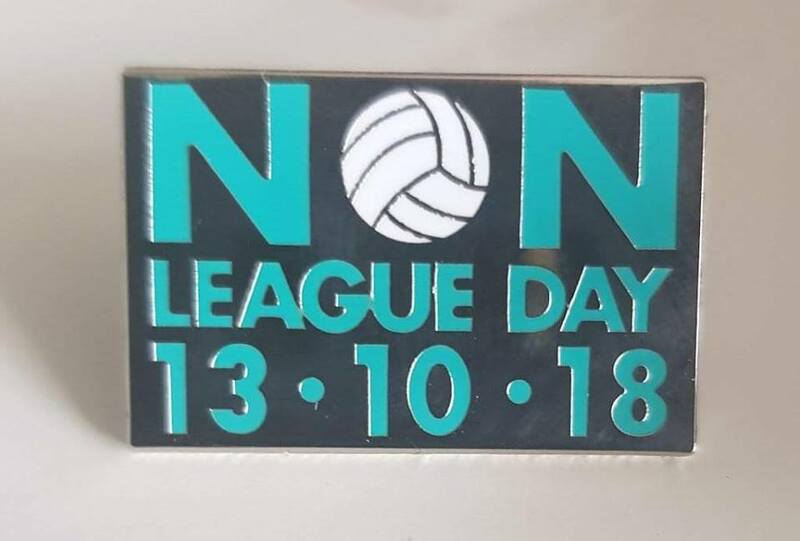 The Stones have been big supporters of Non-League Day since it began in 2010 and were the first club to ever offer a discount to coincide with the event. This year is no different with a number of ticket promotions available and sponsors Wenzel's (a local bakery who make the best doughnuts in the world IMHO) will also be doing a few things. I'm highly tempted by this one and you should be too! Welling United v Slough Town @3pm - there's also a very intriguing clash between two of the top five at Park View Road. Discounts are available for Premier League and EFL season-ticket holders. Chessington & Hook United v Sandhurst Town @3pm - the Blues are offering free entry to the first five adults who bring a child and will then be hosting a half-time penalty competition for kids with 'prizes to be won'! Chertsey Town v Flackwell Heath @3pm - on Saturday the Curfews comfortably extended their unbeaten run to remain top of the Combined Counties League. Will midtable Hellenic League side Flackwell Heath cause a cupset and bring their hot streak to an end??? St Panteleimon v Cray Valley PM @3pm - to my knowledge the Saints are the lowest ranked London club left in the competition. Playing in the 11th tier and groundsharing with North Greenford United, they have produced a couple of notable upsets in the two previous rounds. On Saturday they play a team who are doing well in the Southern Counties East League, two levels above them, who caused a number of upsets themselves on the way to winning the London Senior Cup in 2017 - surely they can't win again?? ?